Every new year, I have to edit the year on my copyright for photos imported into Aperture 2, and every year, I search for the same web article online to figure out how to do it! I love when we vacation on the Maine coast. It’s one of my favorite places! Unfortunately, we won’t be traveling to the Maine coast this summer, but we do have plenty of other areas to visit! Bart Busschots and Allison Sheridan were discussing Aperture 2 on the Nosillacast podcast this week, and Bart was complaining about the way Smart Albums were working (or not working) for him. I think I have a solution to his problem. My friend Allison from the Nosillacast podcast was having problems exporting her jpg files. She was using the "JPEG – Original Size" preset to export, but she said that the exported files were only 200kb, much too small to use for a calendar. I am hoping that I figured out her problem toward the end of this tutorial, but before we get to that, let’s take a closer look at the Aperture 2 Export options and presets. This tutorial takes you through a few of the customizations and options of the Adjustments panel. Keep in mind, the Adjustments panel has a set of menus, and each tool has its own menu as well. 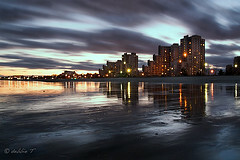 Long shutter speeds are great for ocean and sky shots. Also great for night shots. Tonight my wonderful husband drove me to a nearby beach to take some long exposure photos. It was very cold and the wind was strong, but I had a great time! The RAW photo was edited in Aperture 2, along with some “dodge and burn” – love the dodge & burn in Aperture 2. Hopefully this version (check software update) will fix all the ongoing problems, such as importing in Aperture. I will probably hold off for a day or two before installing. Just to get my backups in order. It looks like there could be further issues. update 2008-11-8: Installed the update yesterday, and so far so good. No problems w/ importing photos and/or editing. 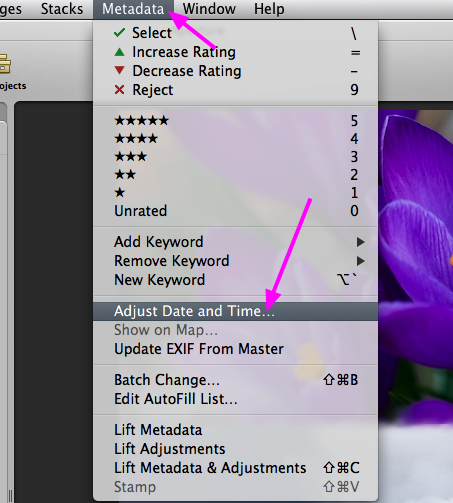 So, you have a photo in Aperture 2, and you need the date (and/or time) adjusted. It’s actually pretty easy once you know where Aperture has hidden the option! See further below for info on changing multiple images. Select the photo, choose Metadata>Adjust Date &amp; Time from the menu. I tried a quick experiment tonight with Aperture 2. I wanted to see how Aperture’s project import and export worked and if photos would be duplicated if the same project was imported. First, I exported a small project from my Aperture 2 library. I launched a new test Aperture library and imported the project. I checked to make sure that it was imported into the Aperture library, and not referenced. All looked good. Back to my original library, I made some editing adjustments to one photo in the project, then exported the project as a new name. Launched my test library and imported the 2nd project. It imported as a brand new project, with no notations of duplicated data. I thought maybe it was due to the different project name, so I went back to my main library, and exported the project as the original name. In my test library, I imported the 3rd project, and it added it as a new project with (1) in the project name, again with no indication of duplicated files. So, this means that if you like to work on projects on different computers, you will have to be careful with importing. I was sort of expecting (hoping) Aperture would “merge” the two projects together, updating any editing adjustments or meta data to all the files, instead of creating a new project all together. Oh I love this, and I just found it by accident. I had an open project, and noticed that somehow there was a tab at the top of my browser workspace. hmm, how did that get there? I Googled “aperture 2 multiple tabs” and found out that you can command + click on a project to open it in a tab. I am constantly switching from one project to another, and it’s annoying to keep switching from the meta or adjustments to project mode to choose a new project. This will be so much more efficient to have all the projects I need open at once. Yeah, I suppose I will still have to click the tab to switch the project, but it’s still quicker than switching to projects mode, then scrolling to find my project.